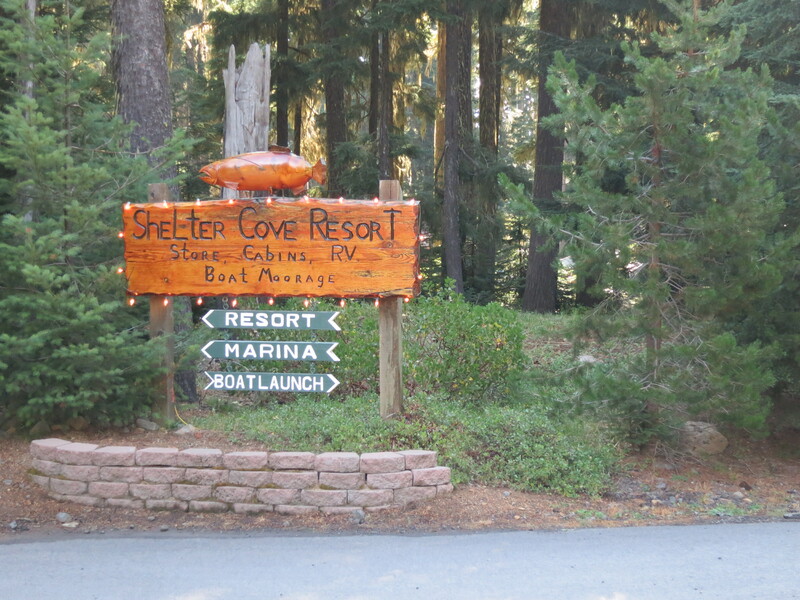 Yogis’ guidebook made it seem like Shelter Cove Resort was not a stop to look forward to. It said there was no food besides the extremely overpriced items in the store, and the coin operated showers cost $1.50 for just three minutes of water. I planned on picking up my packages and perhaps heading down the road to the Ski Pass a bit later on for some pizza. I ate some breakfast, packed up my wet gear, and headed out. The directions written in Yogi’s guidebook on how to get to Shelter Cove were quite confusing to me and I kept my eye out for Pengra Pass, where I was supposed to turn onto a jeep road. At some point, I realized that I had overshot this intersection by quite aways and was now close to the highway and Ski Pass! I had no choice but to turn around and go back. The distance that I had just covered seemed to take twice as long on the return. 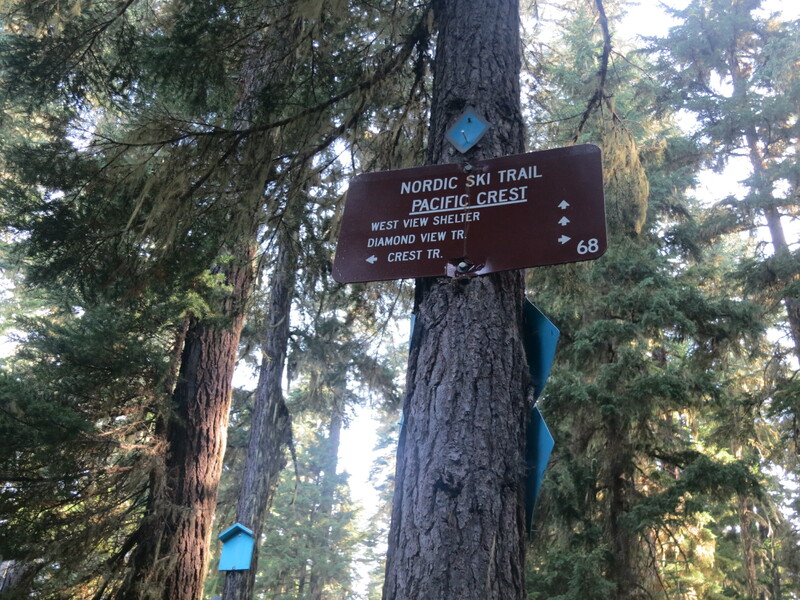 I saw the sign pointing to Shelter Cove that I had missed and then discovered that it was 2.2 miles off the PCT and not 1.6 as Yogi had said. This did not make me happy… A few times, I got a bit mixed up and lost more time finding the route. 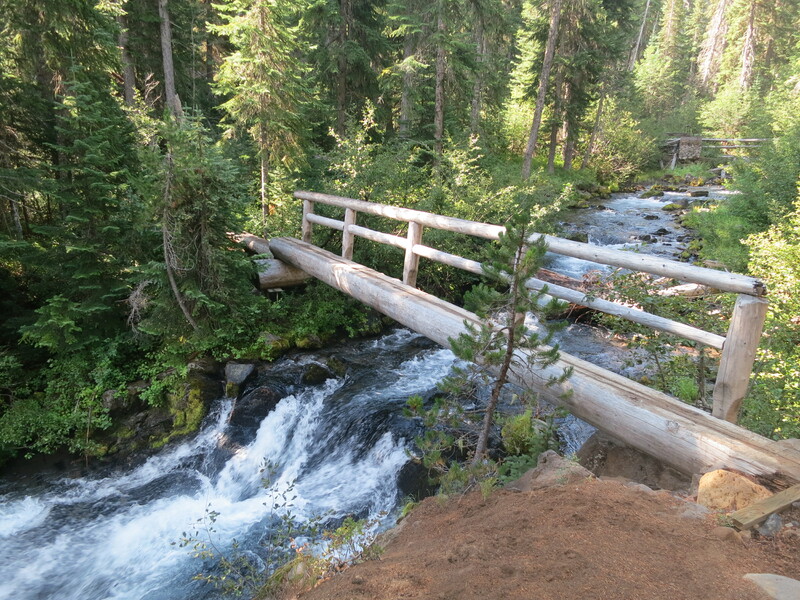 The side trail merged with the Oregon Skyline Trail and crossed a river and continued through the woods. 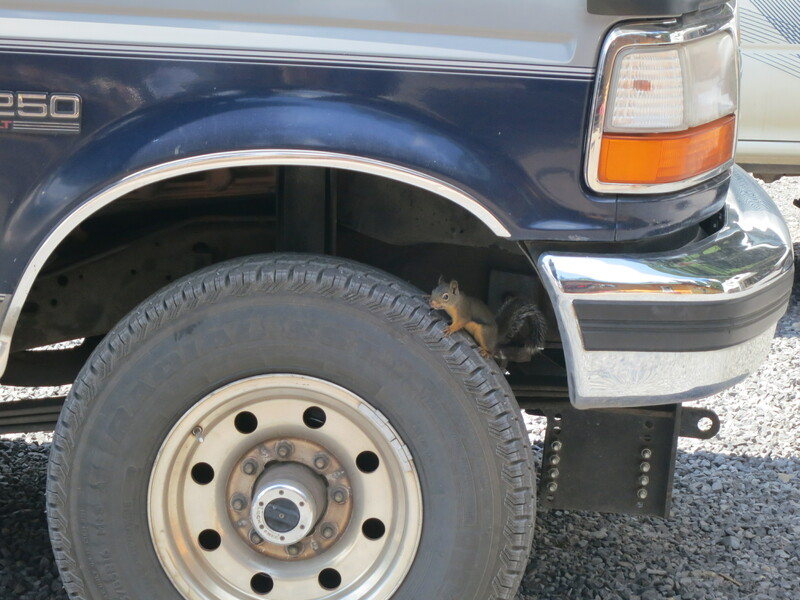 I saw a couple of campers packing up and said hi to one of them, but she didn’t seem to hear me. Then, I came out onto some railroad tracks and found Slack! He seemed happy to see me and reached out his arms to give me a hug. Since I wasn’t expecting that, and because I felt disgusting and had my backpack on, I did not respond. He withdrew his arms, but told me that I was close to the resort and couldn’t miss it. He also said there might be an opportunity for breakfast! He said he had zeroed there yesterday and was about to briefly head back in to visit with some friends. I told him I would see him there! I reached the resort and headed by some cabins toward the biggest building I could see, assuming it was the store. I dropped my pack, went inside and asked for my two boxes. The lady looked on the list and told me there were three for me. I told her she must be mistaken. The woman at the post office in Seiad Valley had told me that there was a hiker about a week ahead of me, with exactly the same name except for the T in my last name! When she discovered that there were two of us, she got concerned about giving out the wrong packages. At every one of my stops after this, I felt even more nervous about my boxes still being there. It turned out that I did receive three boxes because, somehow, the one that was sent by my reader, John, that he had sent by UPS, got there! I told him that Shelter Cove doesn’t accept UPS mail and he sent out a second package. I now had a huge amount of food to sort through (and unfortunately, no way to ship anything out)! I saw Band Leader and gave him a hug just as Slack was coming over. When I mentioned that my stomach was still very much hurting, he asked me if I wanted to try some of his bitter tea from Guatemala that was supposed to help with stomach issues. He put some into a ziplock baggie for me. Meanwhile, I asked every hiker that passed by, where this breakfast was and if it was still going on. It was now well after 10! They told me the number of the cabin. I told Slack that I would have more food for him later after only doing a quick, initial sort, but that I wanted to run to see if I could get some breakfast first. 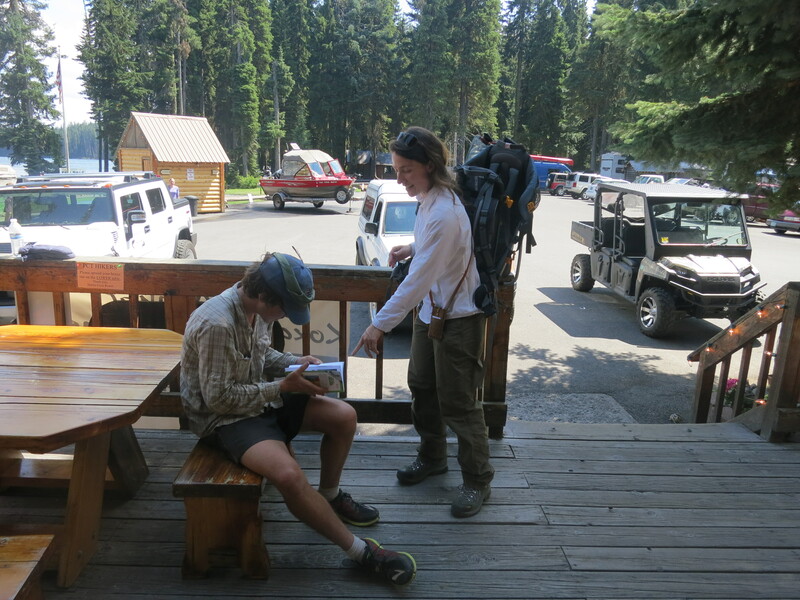 Then, I said goodbye to Band Leader who had a crazy plan to get to Timberline Lodge in 6 days! “Maybe I’ll see you in Washington” I told him. I headed over to the cabin and found Prophet sitting at a picnic table outside. 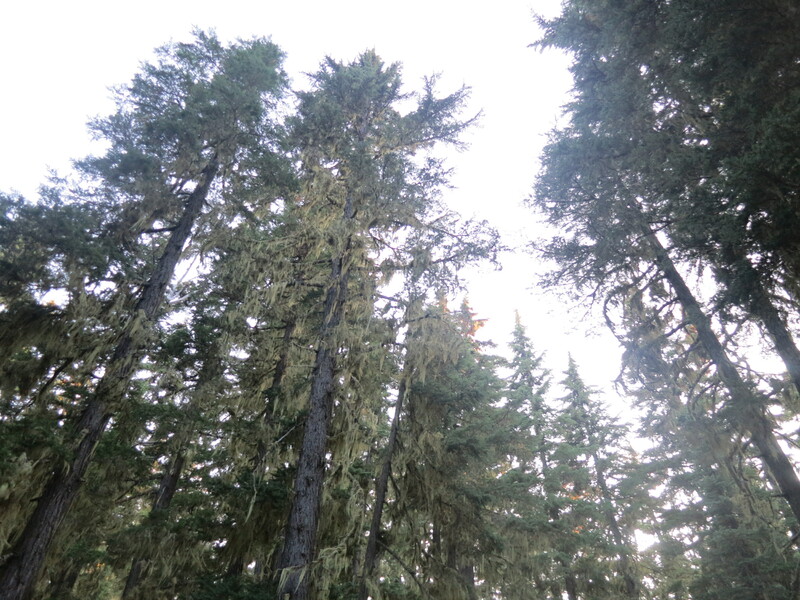 He pointed to the door of the cabin and as I stepped in, a man directed me back outside. He opened up a large cooler and took out some salad, cold scrambled eggs, bread, bananas, salmon, and cheesecake! I had missed the french toast. He got me a cup of coffee and let me pick out anything that I wanted. Lotus and Hermes were nearby playing with their two children. A little later, Heidi, the man’s wife came over to introduce herself. They were a bit stressed about the check-out time of 11 and needed me to give back the fork and coffee cup to clean and place back in the cabin. I thanked them and headed back to the store to get quarters for the shower. The employees were very nice and had no problem giving me as many quarters as I needed for the washer, dryer, and shower! I collected my dirty clothes and headed over to the one unit. I took a luxurious nine minute shower and felt so much better! 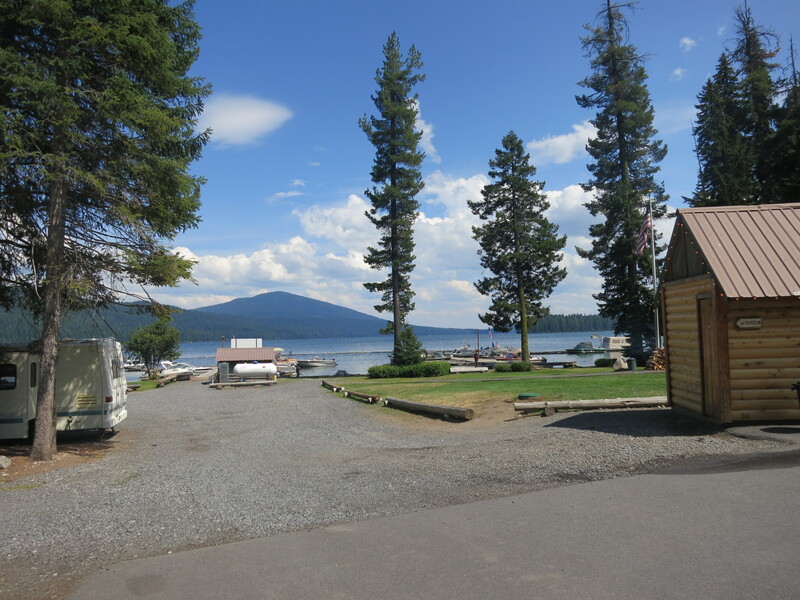 A friend from high school who lives in Portland had agreed to take me into Bend, and after not showering or doing laundry at Mazama Village, without doing those things here, meeting me would have been a much more awful experience for her! I headed back to the picnic table, spread out my wet groundsheet to dry, along with my thermal bottoms which could not be put in the drier, and started sorting. John sent me so many goodies! When I saw the two Ghiradelli chocolate bars, I hugged them to my chest! He also sent me a bag of plantains, a bunch of different dinners, strawberries that he had dehydrated himself, my first jar of Nutella, dehydrated smoothies with protein powder, a packet of tortillas, and many other things! I found outlets on the outside of the store to recharge my electronics, and was happy to discover that we had cell service here! 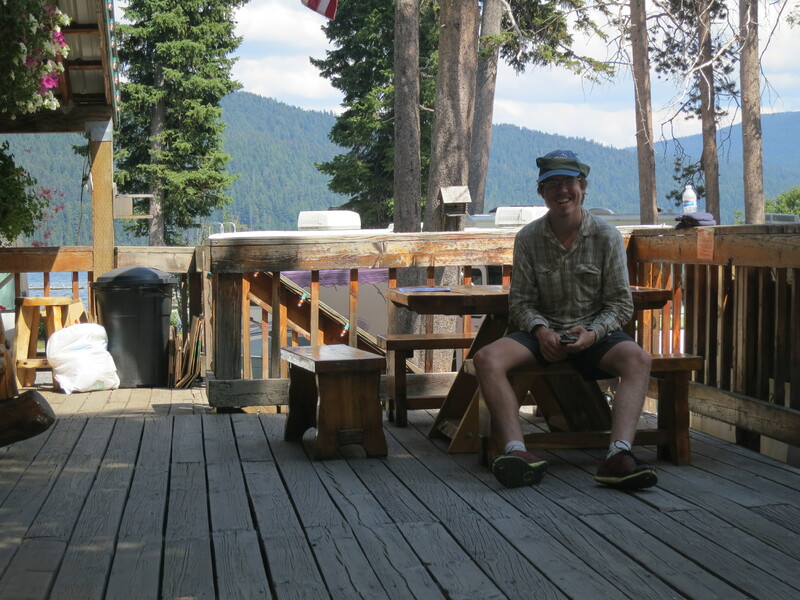 (At Mazama Village, they charged a fee for wi-fi use). This place turned out to be a wonderful stop! 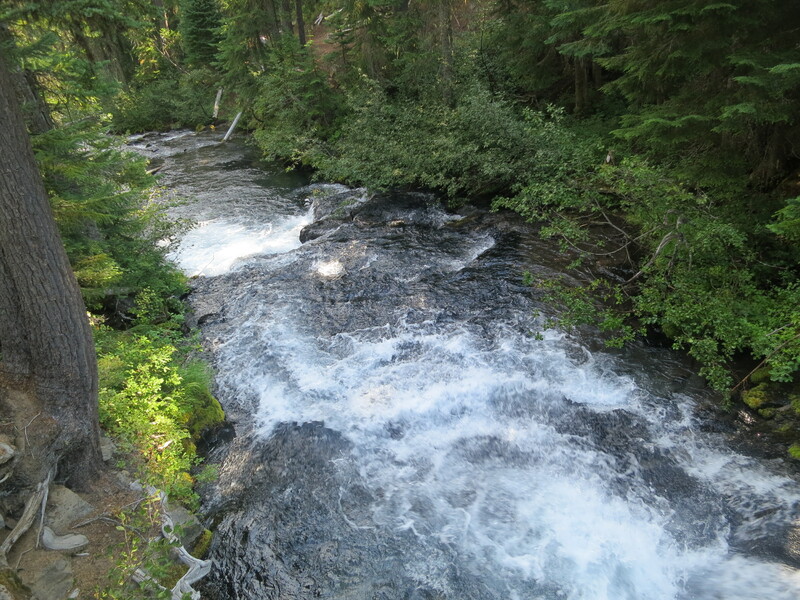 I wished I could stay and relax, but I had a tight schedule to adhere to- both with the finish date and meeting my friend on the only day she was available to come to McKenzie Pass. As I sorted, Tumbleweed arrived! He had also not seen anyone in the last section. Neither one of us had realized until it was too late, that we could have cut 8 miles off of our hike. I made myself a smoothie and layered some Nutella on top of a tortilla for lunch. 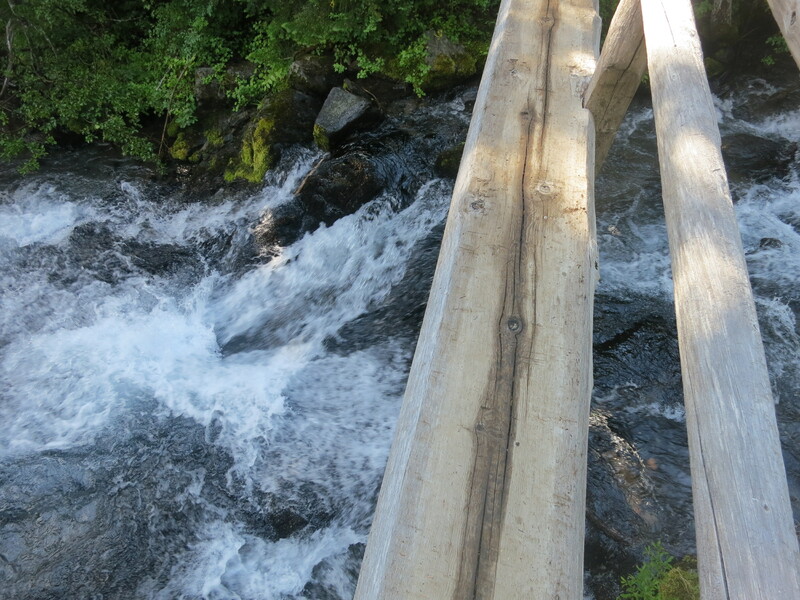 I now had so much food that I no longer felt the desire to head off trail to the Ski Pass. Instead, I could just sit and eat here! Heidi came back from a short walk with her kids and after they got their hot dog and ice cream treats, her daughter asked Tumbleweed and I if we wanted an ice cream! Yes, please! I had discovered that Heidi had been reading Hermes and Lotus’ blog and started communicating with them during their hike. She offered to rent a cabin and share it with them when they arrived here and brought all sorts of healthy food to feed them with! Prophet was in the right place at the right time and got to share the amazing dinner and sleep in the cabin as well! And many hikers got to share the delicious breakfast in the morning. 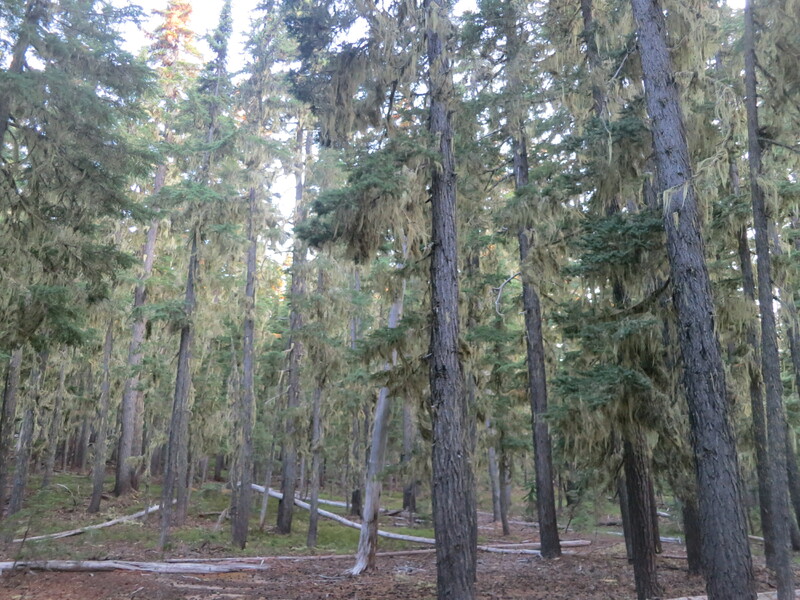 Heidi was very empathetic about my intestinal problems and suggested I could make tea out of the Old Man’s Beard moss that was hanging from the trees. She said it had anibacterial properties. As a nurse, she explained that many of her patients who did not respond to antibiotics found this helpful with their ailments. 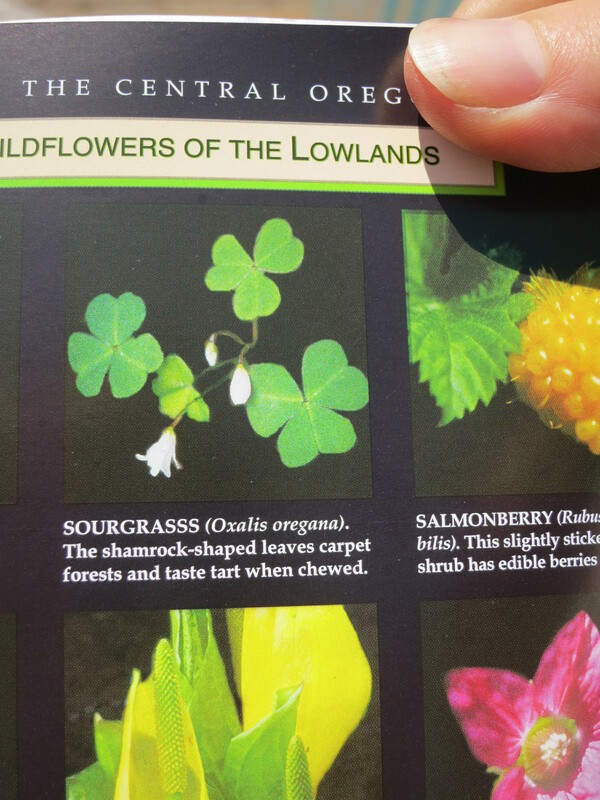 She also had a guidebook of local plants and pointed out a few that might be helpful to me. As we finished our ice cream sandwiches, she offered us a ride back to the trail if we wanted. I took her up on it, as I was already feeling stressed and behind and didn’t feel any need to hike the 2.2 mile side trail back. I raced around, filling up my water bottles, and stuffing as much of my possessions into my pack as I could. I felt so lucky to have met this wonderful woman and her family! We found the trailhead and I sat on the gravel in the parking lot, finishing my sorting. I still had to put on my socks, shoes, and gaitors, as well. There was a man standing by his car who I went over to ask if he wouldn’t mind taking a few extra things back with him to throw out for me. “Maybe you can use some of them!”. I gave him a few quarters as payment. Then, I put on my huge pack and started climbing. Several day hikers were making their way down. 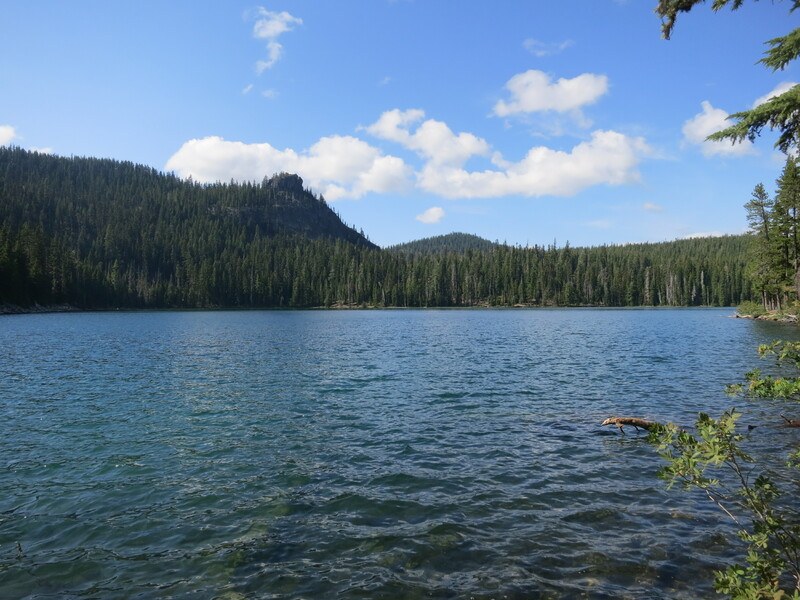 In three miles, I reached Lower Rosary Lake and took a break at the edge of the water. It was nice and peaceful. Before long, two girls who were talking very loudly came along. They also sat at the edge of the lake, a little away from me, and continued talking. 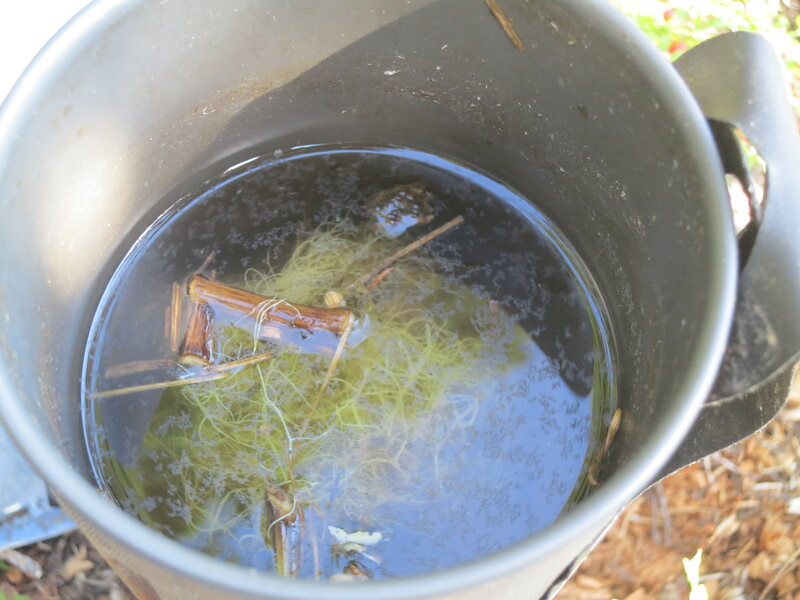 I packed up and headed along but before long, decided to take another break and boil water for some medicinal tea. I added some Old Man’s Beard for double the effect. It was the most bitter thing I had ever tasted and I needed to eat a lot of the plantains and chocolate bar just to get it into my system! Wow! The trail continued to climb and then, as it descended, I could make out a building that we were allowed to sleep in just off the trail. I assumed other people would be in it, however, and wanting (needing) my own space, I continued on. I passed by two girls (non thru-hikers) who were cooking their dinner beside their tents and continued on through the forest. As the sun sank, I noticed a flat area off to the side of the trail and walked towards it to scout out a spot to set up camp. After I ate my dinner, I boiled water for a second cup of medicinal tea, this time, adding less of the ground up sticks to the water! Still, I needed lots of sugar to counteract the bitterness. 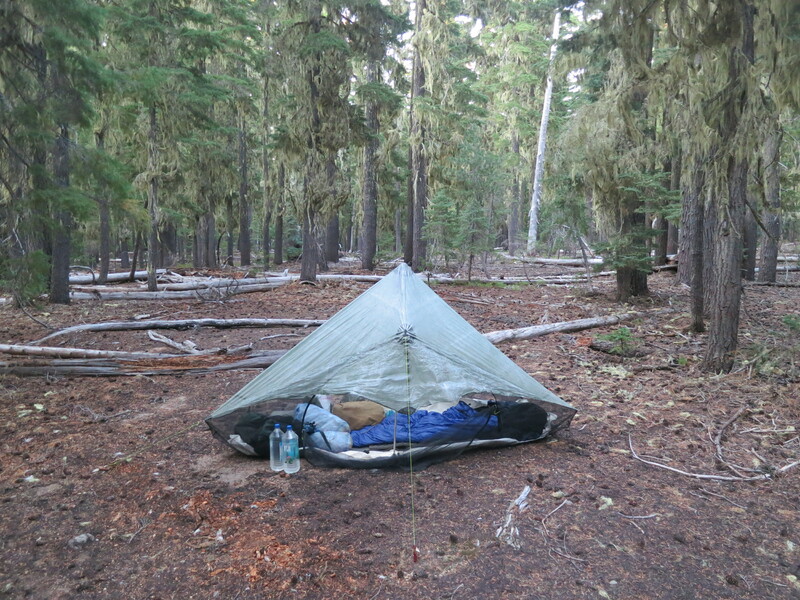 This entry was posted in Uncategorized and tagged Pacific Crest Trail, PCT, PCT blog 2013, Shelter Cove by Wendy. Bookmark the permalink.